I am already mourning the end of Downton Abbey. Oh how is it possible that we have in such a short time exhausted each and every episode? And how is it possible that the gentlemanly Julian Fellowes could choose to leave us hanging in such a manner – I would have expected better form! So with the knowledge that I won’t be invited to my favorite Edwardian abode anytime soon, I found another charming British country house for a vicarious visits. 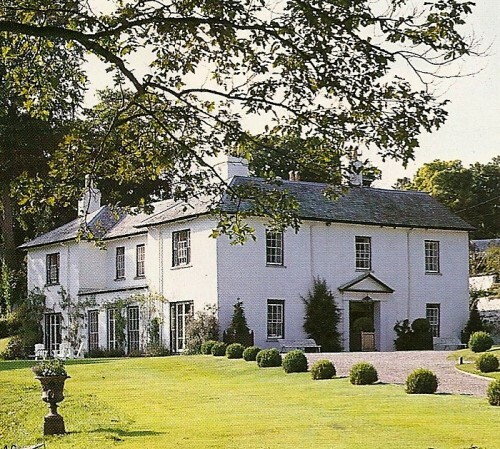 This charming house in Wales is owned by art dealer Guy Morrison and his interior designer wife Penny. Originally built in 1790 with an addition thirty years later, it hadn’t been touched since 1910. The renovation took 18 months with glorious results. and a bar table with their spaniel Winnie standing guard. For the drawing room, Penny designed the claret colored ottoman. 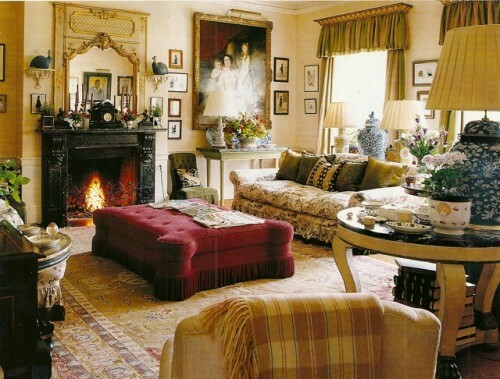 The George Spencer sofas are covered with a Jean Monro chintz and curtains, hung from gilt pelmets, are fashioned from green and beige silk taffeta sown together in stripes. Blue and white china and lamps provide a classic touch of color. Isn’t this breakfast room the epitome of country chic? I love the Pillement Toile with the Bowood – a combination I wouldn’t have thought would work but with the addition of the Ian Mankin check, it somehow does, with the sublime green, a mixture of three Farrow and Ball colors, anchoring it all. and an adjoining pantry with tons of room and accessibility. 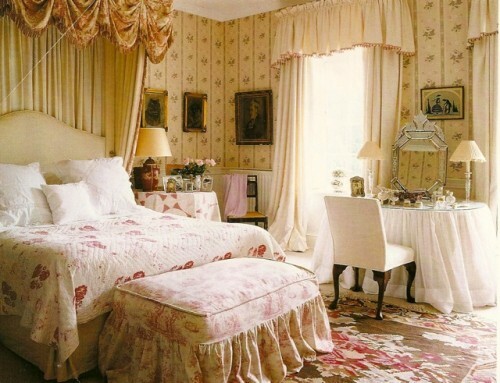 Known as the Pink Bedroom, its charm lies in its eclectic mix. The Zoffany wallpaper, needlepoint rug and antique Toile de Jouy all contribute to the timeless gracious appeal that I think any guest would appreciate. 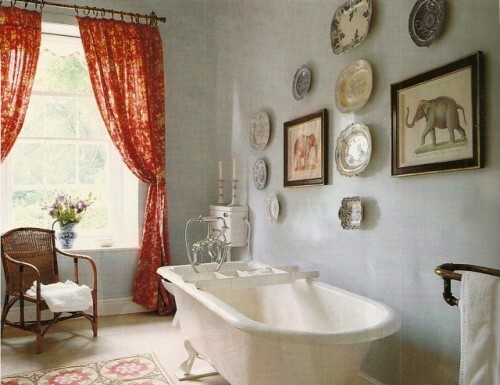 And if Lady Crawley had had such a charming rug, she never would have slipped on that soap! I would happily spend hours in the bath here! So while we all wonder whether the fickle Mary has lost her chance for Matthew and if Mr. Bates and Anna will ever consummate their kiss, we can linger here a while and enjoy the view! If you’re interested, here is a fun Q&A with writer Julia Fellowes on everything from Etiquette to his early influences. And a behind-the-scenes look via tartanscot. This entry posted in dining room, entertainment, furniture, interior design, kitchens. Entry Tags: English Country Houses, Guy Morrison, Houses in Wales, Julian Fellowes, Penny Morrison Bookmark the permalink. So beautiful! 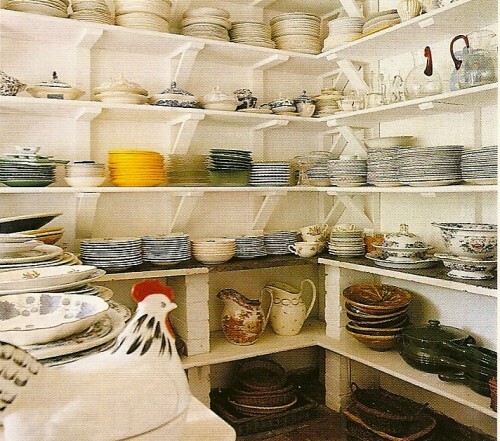 I am swooning over that room of dishes and lusting over that bathroom! Thank you for the lovely comment you left over at mine, having looked at your blog the feeling is mutual! I think a lot of people over here suffered from post Downton Abbey blues, when the series ended, Sunday evenings just weren’t the same! Roll on next series. That house is simply gorgeous, I dream of having a pantry like that. Stunning…love that drawing room in particular and the breakfast room…..do they need a roommate? Yes, it will be a long summer waiting for Dowton Abbey to return in the fall, so I think I will go back and watch the brilliant “Duchess of Duke Street” and re-read lots of Somerset Maugham. Also, for spice, Cold Comfort Farm, would make me happy. Thank goodness there are lots of BBC Masterpiece Theater Classics that can fill the void until Mr. Bates returns. I love the ethereal colors used through this home. The furnishings are beautiful, but not other-the-top; the mix of fabrics is perfect: I think that I could move right in. 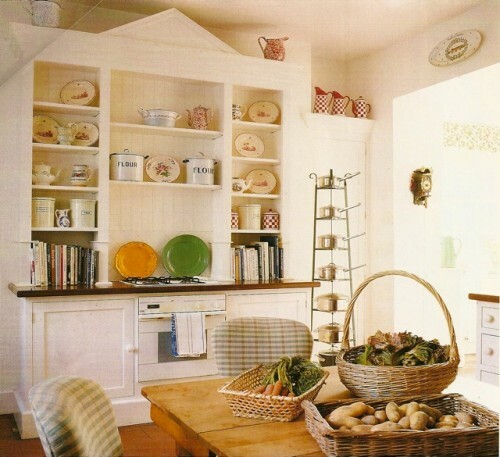 and I LOVE the pantry… I want one too…. Yes! These photos were a treat. My eyes couldn’t savor all of the fine details. Just the mention of Wales brings me back to the stone farmhouse where my husband’s company put us for our time in that beautifully rich countryside. My daughter is dragging me to go workout but I will be back to relish that gorgeous kitchen, look at all of those dishes in the pantry, and look carefully at that armoire with the array of hats! That might be the most beautiful house ever! It would be a dream come to true to renovate and revive life into a country chateau! 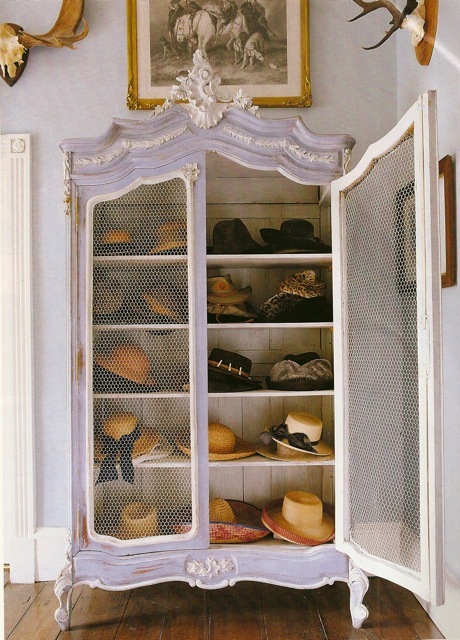 How I would love an armoire just for hats and handbags! Simply beautiful!!! I’m in love with the 2nd picture and the dining room. Lovely. YES, I was ticked off at the cliffhanger. Not just any cliffhanger to get you to watch a next season, but no resolution of any story line AND the start of war! SERIOUSLY?! And how long will we have to wait for series 2? RUDE (but fabulous, he has my attention). What an interesting entry. I have simply Loved Downton Abbey and I agree with you; I hated to see it end. What a sumptuous use of detail and great stories, all perfectly realized by this extraordinary cast. Your entry was perfection. Well-done. I’m on pins and needles waiting to see the outcome!! Wasn’t it amazing?!?! And I love the home you chose. Stately but not too grand, and so elegant. Just right! I’ve been holding off watching the last two episodes since I want to relish them… with the boys in and out of the room, a quiet time is almost impossible! 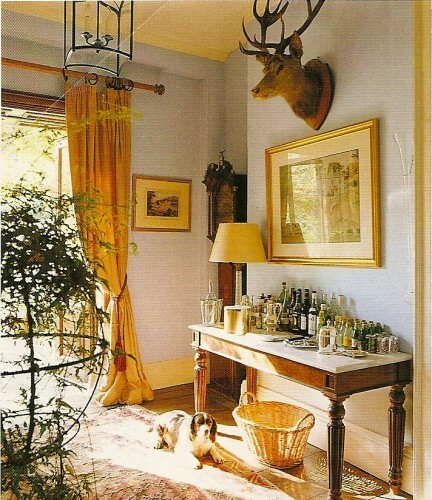 Love the images of this country estate – so charming and liveable. I was trying to keep up with my favorite, but I lost track! The armoire is hte most beautiful I have seem! Well gosh darn I still haven’t seen it but just watched that clip and got completely sucked in. What an incredible house — I envy the butlers pantry. The shade of green in the dining room is so nice. Thanks for the tour! Stunning interiors. I love that french armoire and that butllers pantry. I just learned I can download Downton Abbey to my ipad. I so want to see this series! And, I would love to escape today to the English countryside to a manor like this!! Perhaps it comes with a snow butler, so that when you need to scrape the snow off your roof….you’re covered! I know I could use one here!! So fantastic! 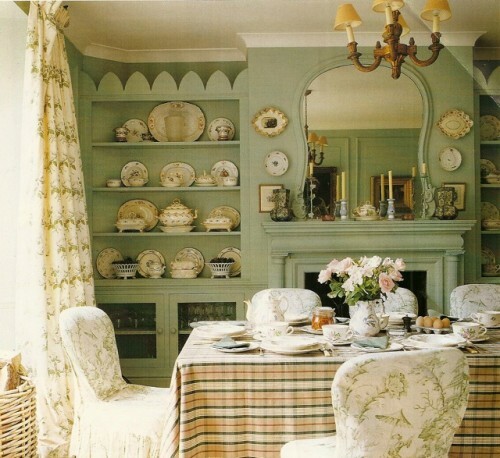 The breakfast room is my favorite I think, such a pretty shade and so cozy, perfect for long mornings of tea and scones. Love it! I am only up to episode 4 of DA…enjoying it thoroughly on my ipad! 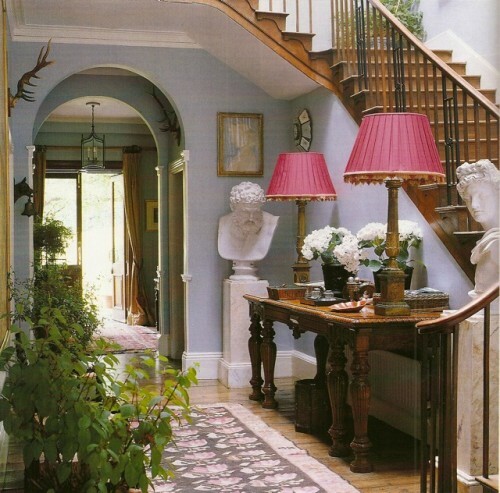 So of course this English manor is completely and utterly my cup of tea! I didn’t want it to end! Thank goodness there will be another season. What a great episode on Sunday night. Thanks for providing all those gorgeous photos, they help prolong the English country manor ambiance that I was steeped in for all four episodes. What a wonderful home! It has so much history. I unfortunately haven’t had a chance to watch Downton Abbey, though everyone has been raving about it. I’ll be sure to check it out. I love anything PBS. Wanted to let you know that I have awarded you with the Super Comment Award! such charm. 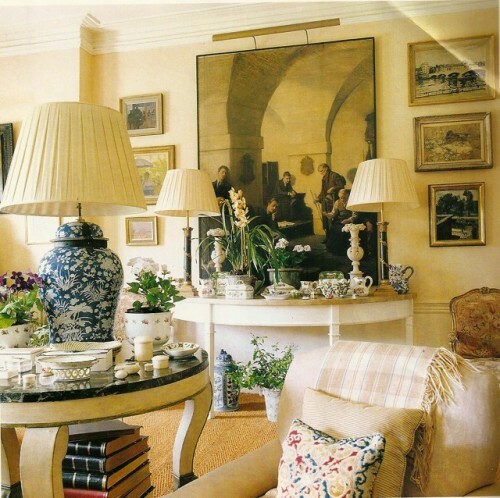 I wonder if the large painting in the drawing room-2nd picture is attributed to anyone? This is a fabulous post. I have never been on your blog before. It is great! You should guest blog for us! Melissa – Thank you! Drop me a line. No worrries- The new season starts filming next month. A little suspense in life a story is good. In life not so much. Michael – Oh not soon enough! Agreed – no suspense in my life is just fine with me! If you enjoyed Downton Abbey, you’ll LOVE the remake of The Forsyte Saga. 85 queries in 0.830 seconds.